The Vegan Mouse: Hank's dinner. Henri had a yummy dinner tonight. 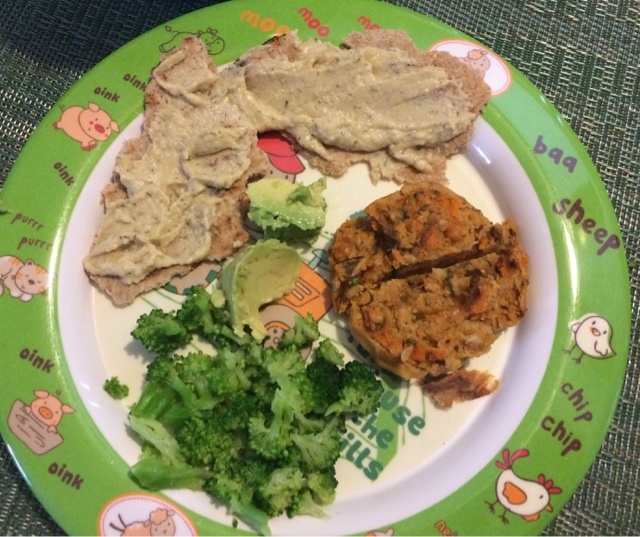 Pita with chickpea spread, sweet potato falafel, broccoli and avocado. He ate everything but the broccoli. Dessert was applesauce and a cutie. He didn't eat it like this, I had to tear off little pieces for him. This guy loves fruits and bread mostly. He likes certain veggies like peas, butternut squash, sweet potato, carrots, zucchini but doesn't care for broccoli. I think if I had mixed it into another dish, he wouldn't mind. As for protein, he likes chickpeas, lentils, tofu and sometimes fish. (He's not vegan.) He doesn't like chicken, eggs or beef much which is fine with me! Every now and then he'll eat a little chicken with his dad. Hi Kim! I think you're doing a great job introducing Hank to different foods, flavors, and textures. Don't give up on the broccoli yet! When my son was starting solid food, I gave him at least 1 piece of something new and/or something he didn't seem to love. Just having 1 bite consistently may change his mind about broccoli! I did this with my son, and although he eats the regular crap that other 9-year-olds eat at school/friends/sports, he has a very adventurous palate and willingly tries anything without coercion. He'll eat kimchi, curry, broccoli, Brussels sprouts, cabbage, beets, fish of all kinds (including sardines- YUCK! ), and different game meats. It's also great to get him used to tasting spices, even if they aren't "hot" spices. I would give him curries with curry powder, cinnamon, ginger, cardamom, coriander, cilantro, etc. and just tone down or eliminate chili powder, jalapeños, etc. You can totally ignore this unsolicited advice, too :) but I thought you might find it helpful and encouraging! He's a cutie!! Good advice Bethany. He's a good eater so I think he'll start to open up to different foods.